In December 2010, back when the What We’ve Been Watching column was in its toddling infancy, I wrote a word or two about the pilot episode of Dirk Gently, BBC Four’s adaptation of the Douglas Adams detective series of the same name. The verdict was a tentative thumbs-up back then — but how’s the full series looking? As I said in my initial review, the main plus point for Dirk Gently is having the consistently great Steven Mangan on board in the lead role — he’s certainly one of our most watchable comedy actors, and is in particularly fine form as the infuriatingly self-sure (but still rather lovely) private detective who believes in ‘the fundamental interconnectedness of all things’. Since the superb Sky One comedy Spy, my eyes have also been belatedly opened to the huge talent of Darren Boyd, who plays Gently’s rather more conventional assistant-slash-business-partner MacDuff — so all in all I can’t help but come to Dirk Gently with a whole heap of goodwill. But I think my enjoyment of this episode can be put down to more than that. It’s a great-looking thing, and the script was sharper than the pilot — I particularly enjoyed the line “his cheque bounced like the proverbial basketball… on a trampoline.” Miss out the word “proverbial” there and it’s prosaic; with it, it’s a winner. There were little gems like this throughout the hour, and Douglas Adams’s genius sense of the absurd is perfectly encapsulated in the idea of ‘zen navigation’: find a car that looks like it knows where it’s going, and follow it. Pretty silly, but highly entertaining. 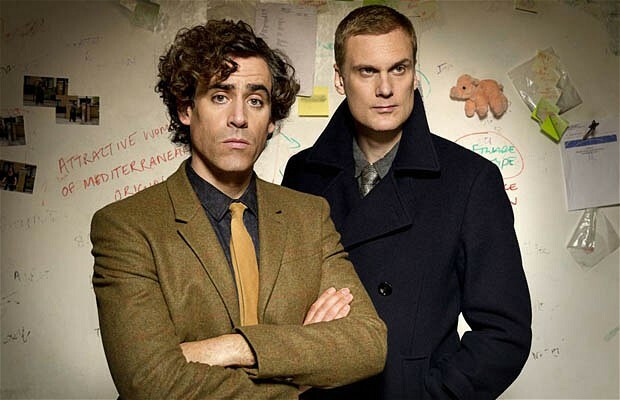 While Dirk Gently was a good programme enhanced by a great cast, the line-up was all that this year’s Secret Policeman’s Ball (Amnesty’s legendary comedy gig) really had going for it — or at least, that’s how it appeared in Channel 4’s edit, which cut down a three-hour show to around 90 minutes. Held in the US for the first time, and in the stunning surroundings of New York’s Radio City Music Hall no less, the sketches were generally pretty mundane, and certainly not helped by the fact that even those that had potential were cut short before they had time to develop. But oh the line-up. Dotted among the ‘straight’ stand-up acts like Jimmy Carr, Sarah Silverman, Jack Whitehall (who seemed to go down a storm) and Eddie Izzard, the special guests were essentially a who’s who of People Anna Likes – everyone from Paul “7th Friend” Rudd and The Daily Show‘s Jon Stewart and John Oliver, to Kristen Wiig, Matt Berry, Peter Serafinowicz, Noel Fielding and even Statler and Waldorf. Not shabby. But is a brief moment of “oh, I love this guy!” every few minutes really enough? Not really. Thankfully, it’s all in the name of a good cause.